Chinese Medicine can support eye health and help preserve vision. This traditional modality is helpful for people looking to reduce the risk developing eye disease and maintain healthy vision. Additionally, patients with existing eye conditions such as chronic dry eyes, cataracts, glaucoma, macular degeneration, and eye floaters can benefit from Traditional Chinese Medicine as part of their treatment plan. Chinese medicine includes the use of acupuncture, herbs, as well as Tui Na (massage therapy), Gui Sha (skin scraping), and Qigong (physical exercises and breathing techniques). Acupuncture involves tiny, disposable needles painlessly inserted at certain points on the body. These points are called “acupressure points.” An acupuncturist can get a good understanding of the patient’s imbalances through an intake examination. The intake includes analysis of the tongue and pulse, symptom information, visual clues and other techniques. Acupuncture works by adjusting and regulating the “Qi-energy,” commonly referred to as “Qi” (pronounced “chi”). Qi flows through the body’s fourteen main distribution channels. These distribution channels are called “meridians,” and they are invisible. There are 71 meridians altogether, though most acupuncturists focus on approximately 20 meridians in determining their treatment strategies. Ten of these channels are internally connected with specific organs such as the Liver/Gall Bladder, Lungs/Large Intestine, Heart/Small Intestine/Triple Heater, Kidneys/Bladder, and Spleen/Stomach. There are also eight “extra channels” throughout the body. 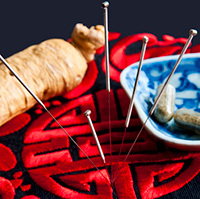 The first records of acupuncture were compiled in mainland China between 300 BC and 100 BC. Relatively recent archeological findings, however, suggest that acupuncture may have been around for at least the last five thousand years. Millennia of trial and error accompanied by meticulous observation allowed the Chinese to accurately map out the locations of these meridians/channels. Each channel has energy nodes or neurovascular junctions called “acupoints.” In the acupoints, the energy becomes more concentrated and can be more easily accessed and stimulated. Additionally, the hundreds of acupuncture points each have a specific regulatory function within the body. From a Western perspective, acupuncture increases blood flow to the eyes. Acupuncture also supports the healthy flow of energy and fluids. We know this because research using ocular Doppler imaging and ultrasound have shown that stimulating certain acupuncture points directly increases blood flow to the eye. We know that many ophthalmic conditions progress because of impaired blood and energy flow. This result in reduced flow of oxygen and vital nutrients to the eyes. A range of eye diseases may manifest, including macular degeneration, glaucoma, and cataracts. Impaired circulation to the eyes also results in toxic accumulation of metabolic ocular waste products. These are waste products produced by the eye in its normal day-to-day functioning. Another way acupuncture improves vision is by stimulating the ocular nerve cells (retina, ganglia, optic nerve, etc.). Nerve cells not being nourished properly can become inactive and go into a dormant state. Acupuncture can arouse dormant nerve cells, often resulting in an improvement in visual acuity. The amount of improvement in vision that patients will see is directly related to the ratio of dormant-to-dead ocular nerve cells. The more dormant cells a person has, the greater the improvement. Small or no gains may indicate that there is relatively little or no cell dormancy. Acupuncture can also help improve vision-related to nearsightedness and farsightedness by strengthening overall circulation and the flow of energy to the muscles of the eyes. According to Traditional Chinese Medicine (TCM), all diseases involving the eye are closely related to the liver (meridian). Additionally, all the meridians run through the eyes. Therefore, if any meridians are out of balance, this can affect vision. For example, the lens of the eye and the pupil basically belong to the kidney, the sclera to the lungs, the arteries and veins to the heart, the top eyelid to the spleen, the bottom eyelid to the stomach, and the cornea and iris to the liver. The spleen and stomach meridians also control circulation in the eyes. Therefore, an imbalance in any of these meridians may lead to eye disease. A very small study found the acupuncture temporarily reduced intraocular pressure (important for glaucoma patients). 4. Chinese medicine has been shown to help people preserve their vision. Adding acupuncture and other forms of Chinese Medicine to a treatment plan can be beneficial to patients with eye disease and vision conditions. Several vision-support products are based on Chinese medicine principles. Revision Formula is based on a classic Chinese medicine liver tonic supporting overall circulation and movement of energy throughout the body, and may help reduce eye floaters based on the Chinese medical model. It also helps to protect the body against stress. It is based on the classic formula Rambling Powder (Xiao Yao San). From a Chinese medical perspective it support the health of the vitreous, optic nerve and macula by not only supporting blood circulation but by eliminating energy stagnation in the eyes. Retinal Support Formula helps strengthen the retina by means of a synergistic combination of Chinese and western herbs. From a Chinese medical perspective, it nourishes the kidneys, liver and spleen. It nourishes and strengthens the retina by supporting blood circulation and building blood quality, decreasing “dampness” (which in Chinese medicine refers to retained water caused by spleen imbalances), and enhancing energy levels. Dr. Grossman recommends it for support of the macular system, circulation in the retina, and including the photoreceptor cell tissue. Vision Boost is a formula to provide energy to the eyes and supports overall energy levels, especially if you suffer from computer eye strain. It also supports mental focus. It is based on Chinese medicine’s Ming Mu Di Huang Wan, traditionally recognized for its ability to support vision health and relieve fatigue. Up Next: Read more about Acupuncture and Eye Disease.